The Little Clinic provides high quality, affordable healthcare located in convenient retail settings. 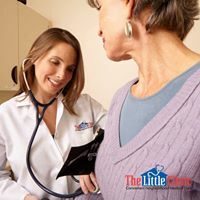 The Little Clinic diagnoses and treats minor illnesses for patients 12 months and up (24 months and up in Kentucky) with care provided by board-certified nurse practitioners and/or physician assistants. The Little Clinic began in 2003 with its first locations in Louisville, Kentucky. Company founders believed a new model was needed to make quality healthcare more accessible and affordable for busy individuals who juggle demands of work and family every day. The concept of locating professionally staffed healthcare clinics in retail stores provided a welcomed solution for households needing convenience and affordability in their healthcare delivery. Also, patients cited the need for a complement to primary care physicians after normal office hours or on weekends. Since 2003, the company has expanded to serve patients in multiple regions of the country. High patient satisfaction scores clearly indicate how much patients enjoy their experiences at The Little Clinic. The company earned accreditation from The Joint Commission. The Gold Seal of Approval recognizes The Little Clinic commitment to meet The Joint Commission state-of-the-art, rigorous national standards for patient safety and quality improvement. In 2010, the company was purchased by The Kroger Co. The Little Clinic operates over 215 clinics in select Kroger, Fry's, JayC, Dillons and King Soopers stores in Ohio, Kansas, Kentucky, Tennessee, Arizona, Georgia, Indiana, Virginia and Colorado.